Your referral of a friend, family member or colleague is one of the greatest compliments we can receive. The Referral Program is our way of rewarding you with more than a simple "thank you". For each person you refer who makes a purchase (for the first time or renewal), you will get 3 free months to your subscription. Find your own unique referral link on the Account Settings page and share it on Facebook, Twitter, Pinterest or your blog – wherever your friends can see it. Or, use the direct share buttons which include your referral link. You will receive an email message each time someone you refer makes a purchase. Since there is no limit to the number of times that you can share your referral link with different people, there is also no limit to the number of free months you get! 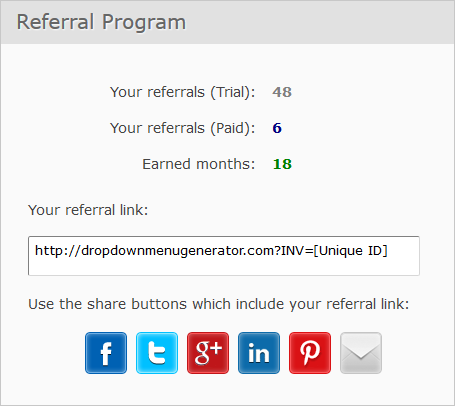 Participate in our Referral Program and use Menu Generator for FREE!